Everyone, check your feeds, for the Queen has tweeted. Queen Elizabeth II celebrated her 90th birthday last week, and people around the world were celebrating her incredible life and reign so far — including sending The Royal Family a barrage of sweet, birthday messages on Twitter. In return, the Queen (yes, the Queen herself) sent a lovely thank you to everyone who wished her a happy birthday in the style most befitting a modern monarch, by tweeting it. I am most grateful for the many digital messages of goodwill I have received and would like to thank you all for your kindness. Elizabeth R.
The thank you message is the second instance where the Queen has posted on Twitter herself. The first time was in 2014, while opening the Information Age exhibit at the British Science Museum. 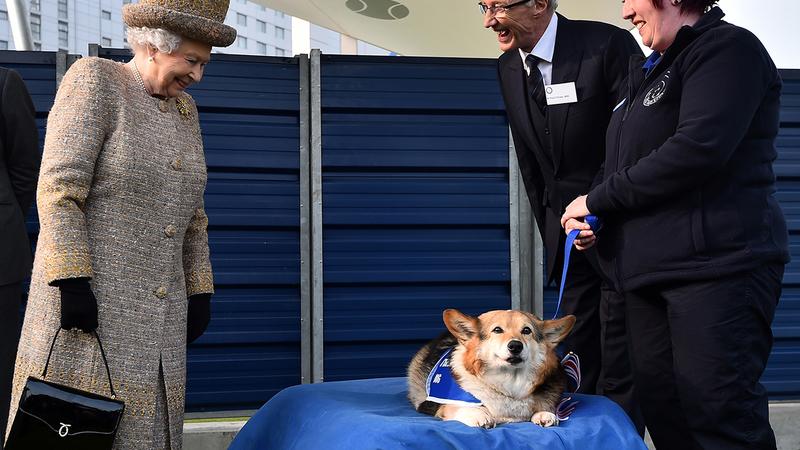 Happy 90th birthday to Her Majesty, who is truly a Millennial at heart. June 1927: A positively precious portrait of Princess Elizabeth, daughter of the Duke and Duchess of York. January 1932: Princess Elizabeth, wearing a sharp little coat, walks in to visit the Royal Tournament at Olympia. January 1933: Princess Elizabeth stands beside her younger sister, Princess Margaret Rose. June 1936: Wearing a sweet pink dress, Princess Elizabeth looks quite charming, standing with her mother and sister. January 1938: Princess Elizabeth standing with her grandmother, Queen Mary, matching her younger sister in a long trench coat and mary-jane shoes. June 1940: Princess Elizabeth looking studious (if unhappily so) at Windsor Castle. May 1944: Princess Elizabeth wearing a summer dress and sunhat in the grounds of Windsor Castle. February 1952: An official picture of when Princess Elizabeth acceded to the throne, becoming Queen, and wearing some impressive jewels. December 1953: Talk about a long train! Her Majesty at her wedding to the Duke of Edinburgh. March 1954: Queen Elizabeth II on the balcony of Government House, Melbourne, during her tour of Australia. April 1954: The Queen in a floral-patterned dress for a tour of Aden, Yemen. November 1954: Queen Elizabeth dancing with Air Marshal Sir John Baldwin, at a ball held at the Hyde Park Hotel, London, 26th November 1954. The ball celebrated the centenary of the Battle of Balaclava. June 1956: Queen Elizabeth II in Sweden, wearing a lot of pearls and an interesting hat. January 1960: The Queen wearing a classic jacket as she stands with Prince Charles and Prince Edward at Windsor castle. July 1965: Queen Elizabeth II wore a vibrant coat and hat at Ventnor during a royal visit to the Isle of Wight. January 1969: The Queen, in a fuchsia dress, walks beside U.S. President Richard Nixon. January 1973: Now that is glamour: from the intricate pattern, to the fur and crown, there's not much else we can ask for! February 1977: Queen Elizabeth looks like she's ready for spring in this plaid dress and bright hat. July 1982: Navy and white is always in style, and we appreciate the small pattern on her dress mixed with the bold lines of the hat. October 1986: Queen Elizabeth II stands out in robin's egg blue during a visit to Hong Kong. May 1993: The Queen and Prince Philip attend a formal banquet, the queen in a bright pink gown and a very expensive -- and we expect heavy -- accessory on her head. March 1995: The Queen visited South Africa and wore a bright yellow hat with this patterned dress. November 1998: London must be chilly in November! The Queen wore this large fur coat as she left the House of the Lords. November 2002: The Queen and Prince Philip attend the premiere of the "Die Another Day" James Bond flick, dressed to impress! November 2003: U.S. President George W. Bush is formally welcomed to the U.K. by the Queen, dressed here in a lilac coat and hat. June 2004: The Queen's hats keep getting better and better, and we love the top hat vibe this one has for Trooping the Colour. June 2005: A lady in pink always shows up men in black (though they look quite dapper as well!). October 2005: Her Majesty looked stunning in this white coat to visit the Tynemouth Volunteer Life Brigade Watch House and Museum. May 2006: Queen Elizabeth II attends the Order of the Bath service, dressed in traditional garments, and looking lovely. June 2006: The Queen looks chic in this dress as she and Prince Philip attend a performance at the Royal Opera House. May 2007: The Queen dials up the fun of this look by wearing vibrant, neon pink in her accents, paired with a lavender wool coat. October 2007: Her Majesty attends the State Banquet at Buckingham Palace, dressed in silk. June 2008: The Queen hosts a garden party at Buckingham Palace, and we're loving the sheer umbrella. October 2008: The Queen wore this intricately patterned dress during a two-day tour of Slovenia. December 2008: The Queen attends the Christmas Day church service, looking lovely in a holiday-themed outfit. June 2009: Her Majesty knows how to accessorize, and we can't get enough of her great looks! November 2010: The Queen wore this floral dress during a visit to Abu Dhabi. April 2011: Prepping for the royal wedding in style, the Queen attends a dinner in this metallic and periwinkle gown. May 2011: Dashing leaders! Looking stunning in an embellished dress, Queen Elizabeth prepares to attend a State Banquet with U.S. President Barack Obama. June 2012: Queen Elizabeth accessorizes this monochrome ensemble with vibrantly colored flowers. June 2012: The Queen shares a laugh at the Queen's Cup Polo Day in 2012, dressed in the color of success. March 2013: The dark trim on this coat adds another level of sophistication, as if the Queen needed any help in that department! April 2014: This portrait of Queen Elizabeth by photographer David Bailey was released on April 20, 2014 to mark her majesty's 88th birthday on Monday April 21. April 2015: The Queen attends a reception at Canada House on April 19, 2015 in London.